NCR Forms specializes in custom carbonless forms, 2-5 part NCR printing paper products, and carbonless form services for businesses including carbonless invoices, carbonless receipt books, NCR copies, and carbonless printing. Order by size, weight, or quantity, use an NCR template, or adjust from existing files. ☼» All our NCR carbonless forms and carbonless paper printing projects can be fully customized with company info, logo, design, or layout to enhance the professional image and managerial design. ☼» We use high-grade 21 pound NCR forms paper weight to provide consistent quality carbonless forms. ☼» Use our NCR templates or upload your existing files then request adjustments and project proofs. ☼» Since 1999, we've been providing fast & reliable business solutions, combining the work ethic, product quality, and customer service of a small business with the resources and reliablility of a large company. 5.5" X 8.5" OR 8.5" X 5.5"
Click on Details to order. FREE ground Shipping! What is an ncr form? Referred to as carbon less paper, carbonless copy forms, carbonless printing, non copy paper, carbonless forms printing (ncr forms printing), carbonless ncr paper, and many other variations on those central terms, NCR copy products and carbonless copy services (carbonless copies and products) utilize carbonless paper to enable the same benefits of carbon copies -without the carbon. Each top coat transfers information to the sheet below it through micro capsules of ink or dye on the back side of the ncr copy products. When a pen presses against the sheet to write, it breaks micro capsules beneath the page in the pattern of the writing. The micro capsules react with an invisible layer of clay on the top of each layer to form duplicate marks, enabling the transfer of ink down through 2-5 layers of a carbonless ncr form or relevant ncr copy product. Our ncr experts have perfected the carbonless art of ncr copy products and carbonless printing. NCR Forms carbonless copy services (and carbonless copy forms) are top notch. Since 1999, our ncr copy products business has been singularly devoted to providing the fastest turnaround, free shipping, the absolute best customer service, and most reliable carbonless services in the industry. There's no substitute for wholesale carbonless forms and personalized carbonless business forms at great rates. Whether you require a single custom carbonless business form or ten thousand carbonless invoices, custom triplicate forms, order forms, or any of our wholesale carbonless forms or carbonless paper printing, we provide the best prices, strongest array of expert services, and quickest turnaround. 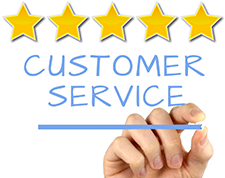 We stand behind our wholesale carbonless forms and services 100% with a world class customer service department that is always available through phone or email to handle any request or need. Don't trust your wholesale carbonless forms and NCR print needs to anyone but the best. No matter what your company uses or requires, we have the carbonless business forms to make your operations run smoothly from a managerial and client based perspective. Our ncr paper printing services and carbonless business forms use high grade 20-21lb weight paper quality, which is an industry best. We handle carbonless forms printing jobs expertly, getting orders out quickly & efficiently while maintaining a wide selection of ncr forms products and carbonless business form services. Our carbonless paper printing products and carbonless forms wholesale services cover the full spectrum of possible business needs. Know generally what you need? Try receipt books; ncr book printing; 2 part invoices; multi part blank carbonless paper and blank ncr paper including 2 and 3 part carbonless paper (3 part ncr paper); color carbonless forms (full color forms and color carbonless forms); and continuous forms like perforated carbonless forms and carbonless copy for an ncr printer. We answer the question of what is carbonless paper, and provide the very best paper services and full form products. The core of our business is great service, reliability, and the 20-21lb ncr papers we use to ensure the very best grade of business forms. Have a question about the weights or grades of our ncr carbonless paper? We are happy to help. Not sure what you need? Our industry experts can help you identify the product line that best fits your existing needs and offer an array of possible solutions for you to choose from. We have all the ncr carbonless paper options and carbonless copy paper products to fill any ncr paper printing needs regardless of complexity, design, organizational needs, or current formatting. If you have a special project, a specific request, or prefer to speak with one of our experts on the phone to go over the details or put in your request, our ncr paper printing experts will be happy to walk you through the steps and ensure that they have everything to do the job right the first time. Give us a call or email to discuss your specific ncr paper printing job and get it started quickly and easily. Our dedication to quality is matched by our dedication to affordability. 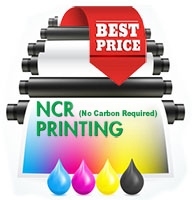 We prefer to let you know our NCR printing prices up front... and our 18+ years of service have enabled us to develop and firmly establish a big business network of contacts and services that help keep our prices rock bottom. Our experience, expertise, and resources allow us to provide cheap ncr printing and ultra-affordable business services while maintaining our original small business mentality towards keeping our clients as happy as possible. Our wholesale carbonless forms stay at wholesale prices to provide cheap ncr printing options without sacrificing the quality we put into every job. Need duplicates? Then two part carbonless paper is your best bet as 2 part ncr printing allows you to issue a single invoice, order form, or receipt while maintaining the original for your records. 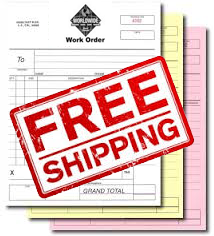 We provide wholesale 2 part carbonless forms, useful 2 part carbonless paper (carbonless paper 2 part), and custom form printing options, including custom 2 part forms and 2 part carbonless forms & NCR paper products. Whether you require blank 2 part ncr paper or custom 2 part forms to align existing managerial needs, we produce every imaginable type of two part forms to free you up to run your business. Use a template or existing file to personalize two part carbonless forms, 2 part carbonless copy paper, and carbonless order forms. Need triplicates? Browse 3 part carbonless forms, blank 3 part carbonless forms, custom carbonless printing invoices, receipts, and more. Order blank 3 part ncr paper or custom 3 part forms to fit specific business needs. Pick your 3 part carbonless forms then use a template or upload an existing file to us with instructions to change, update, format, or otherwise personalize your custom 3 part forms and 3 part NCR paper products. Are you looking for any particular NCR printing needs? Select from multiple sizes, types, and grades of ncr printing services, ncr printer paper, and an array of ncr carbonless paper weights. Our ncr printing and ncr carbonless paper services have received over 4000 5-star ratings from clients because we have mastered the nuances of ncr copies and ncr carbonless paper services. Prefer to print carbonless forms on carbonless printer paper at your location? Some businesses prefer to use their own ncr printer, and don't need custom carbonless invoices, custom triplicate forms, 2 part carbonless forms, 3 part ncr forms, custom carbonless forms printing, or other finished products. Purchasing blank carbonless copy paper enables self printing on carbonless paper. Most businesses runs on invoices (and carbonless order forms), requiring a source of carbonless invoice forms or carbonless invoice printing services. We supply thousands of businesses with custom carbonless invoices (and standard carbonless invoice printing) because our carbonless invoice forms are well designed, reliable, and adaptable to your needs. Just use a custom form printing template or upload your files. We make sure your logo or any other managerial information and marketing materials are designed into custom carbonless invoices so you get functionality with the professional appearance and style your clients and employees will appreciate on all your carbonless printing products. Need non-standard custom triplicate forms or related custom printed forms with your carbonless paper printing order? Our ncr printers and ncr forms printing services can provide any variation on custom triplicate forms depending on your specific business needs or we can combine your existing form format with other custom printed form elements to create your own custom printed forms or custom triplicate forms.